5% early bird discount - limited availability and only on request. Your holiday home on the Ionian Island Zakynthos is situated at a beautiful hillside location at the quiet end of the Cape of Marathias. On the 1.5 acre property of Villas Cavo Marathia a panoramic pool and 14 apartments are distributed and accessible via small paths and steps. You arrive, take a deep breath, and immediately relax your mind: In Villas Cavo Marathia on Zakynthos you have from your own private balcony or terrace an unrivaled panoramic view over the bay of Marathias and the Turtle Island of Zakynthos. So it's the ideal place to have breakfast on a warm summer day or enjoy a light meal with a good bottle of wine. The stylish comfort studios and duplex apartments of Villas Cavo Marathia offer a spacious living and sleeping area, a large marble bathroom with shower and separate toilet. The rooms also include a well equipped kitchen with cooking range & refrigerator for self catering. Our dream path takes you within five minutes through our olive grove to our small private beach (pebbles/rock) right below our residence. Enjoy the seclusion, jump in the refreshing cool water in the morning or in the evening hours or snorkel in the turquoise blue water. In July and August we offer a get together service for free for our guests: Enjoy in the morning at our cosy coffee bar at the panorama terrace a cup of coffee or tea together with a delicious homemade pie. In den low seasons you can book our fresh & healthy breakfast. Don’t want shopping stress at your arrival? Relax and take advantage of our welcome basket. Book a basic or premium basket together with your apartment. You’ll find in the basket – depending on the version – many delicious local groceries as well as a basic package of coffee, tea and a selection of beverages. Daily fresh woodstove bread on reservation. Start the day being sporty and swim a few laps in our new panoramic pool or work out in our fitness room. Relax in the pool deck chairs and enjoy the tranquility and magnificent view of the Villas Cavo Marathia and the bay of Marathias. Relaxing at the beach, learn how to dive, rent a boat and visit our blue caves: Villas Cavo Marathia lies in the heart of the WWF national park of Zakynthos. We are a German-Greek family and live for many years on the island of Zakynthos. In 1998 we opened our Villas Cavo Marathia, 2004 our family apartments and panorama studios were built. We speak German, English, Greek and we would love to welcome at our sunny turtle island Zakynthos! Our family-run little apartment residence is situated at the end of a dead end street, directly at the cape of Marathias in the middle of olive and pinetrees. You'll arrive, take a deep breath and relax. We are happy to give you a hearty welcome at Villas Cavo Marathia! 4 stars rated apartment complex with panorama pool, situated at the quiet dead end at the Cape of Marathias on Zakynthos Island. Individually designed studios and apartments, each featuring a balcony with with panoramic view. An idyllic pebble beach and tavernas are 800m away and can be reached by foot. Two diving bases, bars, restaurant and shopping amenities are five minutes by car. Enjoy a varied breakfast at the little coffee bar on the panorama terrace (additional costs). Bed linen and towels are provided, as well as every second day room service. Rental car recommended. WLAN in all public areas. Pet friendly accomodation (cleaning fee). Family run business since 1998. We just enjoyed seven unforgetable days at Villas Cavo Marathia. What a quiet and peaceful location with perfect service and surrounding. An excellent mixture of hotel and apartment residence with a varied breakfast and take-aways at panorama terrace (extra fees). Lovely apartment, tidy and clean. A romantic pebble beach in 10 minutes walking distance - there is a taverna next by. From our balcony we had an amazing view on the bay and Turtle Island "Marathonissi", one of the landmarks of Zakynthos. Thanks so much to the Zantiotis family for all the helpful recomendations and your hospitality. We're happy to hear that you enjoyed our quiet surrounding and close-by idyllic bay. Also our goal is for our guests to spend a great vacation - what also means to discover the island. Therefore you're very welcome for the advices given on restaurants, beaches and trips. Die Villas Cavo Marathia liegen auf einer Anhöhe, äußerst schön gelegen inmitten unberührter Natur mit perfekter Aussicht aufs Meer. Ruhe und Entspannung pur! Leuten, die nach einem Individualurlaub mitten in unberührter Natur, mit höchstem Erholungsfaktor auf einer Traum-Insel suchen, empfehlen wir die Villas Cavo Marathia wärmstens. Es war ein rundum perfekter Urlaub! herzlichen Dank für diese tolle fünf-Sterne-Bewertung, es freut uns sehr, dass euer Aufenthalt bei euch ein rundum perfekter Urlaub war. Ruhe und Muse mit Meerblick auf dem Balkon, am Pool oder auf der Panorama Terrasse wollen wir unseren Urlaubern in unserer Apartment Anlage ermöglichen - einfach mal Abschalten vom Alltag. Wenn dies gelungen ist, freut es uns sehr. Residenza in luogo incantevole, tranquillissimo e con vista sul mare indimenticabile. le foto rendono benissimo l'idea. appartamento pulito e curato, proprietari che gestiscono la struttura sono molto disponibili ad offrire aiuto, consigli e suggerimenti per qualsiasi dettaglio che riguardi la vacanza. Ospiti di nazionalità italiana, tedesca e inglese. Consiglierei una vacanza in questa residenza soprattutto a coppie. Thank you very much for your very nice recommendation of our little holiday resort! If you ever miss the ocean and the view on the Turtle Island, don't hesitate to come back to visit us! Die Bilder auf der Website verraten schon ein tolles Ambiente. Aber als wir die Villas erreicht haben, waren wir schlichtweg begeistert. Man kommt an und fühlt sich sofort wie im Urlaub - besonders wenn man auf dem Balkon sitzt und das Meer rauschen hört! Die Zimmer waren sehr sauber, individuell und geschmackvoll eingerichtet. Wir haben eine tolle Zeit zusamen mit unseren Freunden auf der Insel genossen, die wirklich viel zu bieten hat. Vor allem hat mir gefallen, dass sie so grün war. Auch in kulinarischem Hinblick haben wir einige sehr idyllisch gelegene Tavernas entdeckt - auch dank der Hotelbesitzer. es gibt sie noch – diese magischen Orte. An eurem Ort scheint die Zeit stillzustehen. Die geschmackvolle Unterkunft und Eure liebevolle Art, es Euren Gästen so komfortabel wie möglich zu machen, wirken Wunder. Sehr genossen haben wir auch das Frühstück – entweder wann und wie wir wollten in unserem Studio oder auch in der kleinen Kaffeebar auf der gigantisch schönen Panoramaterrasse. Ob relaxen in einem der Deckchairs am Pool oder schnorcheln im glasklaren Wasser am nahe gelegenen einsamen Kieselstrand – die Zeit bei Euch war einzigartig. Ob wir wiederkommen? Natürlich! Und wir freuen uns auf ein Wiedersehen. Meine Frau und ich hatten einen sehr angenehmen und erholsamen Aufenthalt. Alles war so, wie wir es aufgrund der Infos im Internet erwartet hatten. Unsere Ferienwohnung war geräumig, sauber und gepflegt. Die Betreuung durch Vermieter und Personal war sehr freundlich und ließ keine Wünsche offen. Besonders dankbar waren wir für die Insider-Tips, von denen wir auf unseren Erkundungstouren mit Mietwagen und -boot profitiert haben. 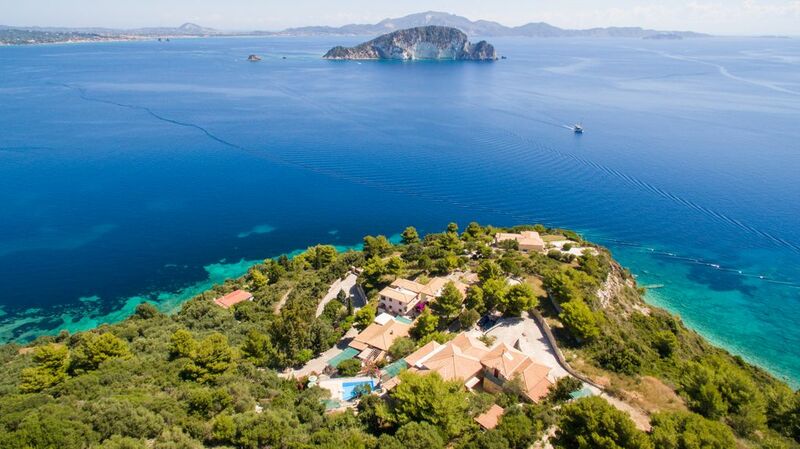 Villas Cavo Marathia in the Ionic Sea on the coast of the sea park of the island of Zakynthos. Exposed location at the end of the beautiful cape of Marathia. Idyllic and paradise-like, quiet secluded location on a slope with an undisturbed sea view. The closest small and peaceful pebble beach is 800 m away together with 2 Greek authentic taverns. Quick connection the airport of Zakynthos 17 km away. Direct weekly charter flight connections from D, CH, A, IT, GB and from Scandinavian countries. You can get an inexpensive rental car directly at the airport. The closest small, romantic harbour city of Limnie Keriou 2.5 km away, popular among sailors, has boat rental, diving schools and shopping facilities and taverns. Other Activities: Snorkelling and diving in crystal-clear water, boating with small rented boats for boating, canoeing in our Keri caves. This price applies to 2 adults and 1 child up to 5 years of age free of charge (including baby bed). Guests can also pick-up at our Panorama Terrace during reception opening hours at the Coffee Bar: coffee specialties such as café latte or frappe, Greek pitas, fresh bread on order, olive oil from our own production and ouzo, wine and soft drinks.